Perhaps in Ireland no type of structure, whether for the living or the dead, has been so long in occupation, so long a thing made use of…Even to-day the modern tramp does not disdain to spend a night in one of the outer chambers when it is big enough to admit him, and everyone knows that the fairies of Ireland never forsook them and still continue to hold high revel in them. 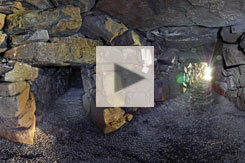 Drag within the image to explore the Binder’s Cove souterrain in virtual reality. Souterrains, from the French “beneath the ground,” were built in the Early Christian period in Ireland as escape routes from invading Vikings (or the plundering clan nearby), and may also have been used as safe places to store the family’s valuables. Being cold year-round, they could also have been used for their more prosaic utility as food larders. They were constructed by digging an open trench, in which a dry-stone wall was assembled on both sides to form a tunnel. Horizontal lintel stones were then laid on top of the wall stones, and the entire assembly, stable without mortar, was then covered with earth. In time there would be no trace on the surface of the hidden escape route underground. Some souterrains, although not the one here, have low “creeps,” blind alleys, split levels, or hidden guard posts, all designed to thwart an enemy. The tunnels can also include ventilation shafts, and niches or cupboards in the walls. Some chambers included stone corbelling of their large inner chambers, similar to that seen both in the Neolithic passage tombs (see Newgrange), and in the Early Christian beehive huts of the Dingle Peninsula (see Gallarus Oratory). John Emerson recounts the typical lore of underground passages. (1979). Binder’s Cove has a short entrance passage, 2 m (6.5 ft) long, with only a meter (3.3 ft) of height, with a low lintel stone at the end that might break the head of an intruder rushing into the dark tunnel. After that constriction, the main passage at Binder’s Cove is about 30 m (98.5 ft) in length, with two side passages that are each about 6 m (20 ft) long. The main passages have about 1.5 m (5 ft) of headroom, and are about 1 m (3.3 ft) wide.